No, this is not the Cotsen Blog’s April Fool’s Day posting! And the classwork was definitely not quite as simple as “making pictures” either. But in a recent class on “Book Illustration Processes” at “Rare Book School,” a program held each summer at the University of Virginia’s main Charlottesville campus, not far from the Thomas Jefferson-designed “Lawn” and Academic Village, we did get to make wood-engravings, metal-cut engravings, and drypoints, as a complement to five days of 8:30 am to 5 pm classes, lectures, and presentations, and lots of scholarly reading. (Definitely not a leisurely “vacation”!) And in the process of putting reading into practice, we did learn a lot about the differences between these illustration processes (and other processes) that were widely used in books for both children and grown-ups from the earliest days of printing into the mid-eighteenth century (when Thomas Bewick began executing wood-engravings) and on into the early twentieth century, when manual illustration processes became supplanted by process-printing and photo-mechanical work. 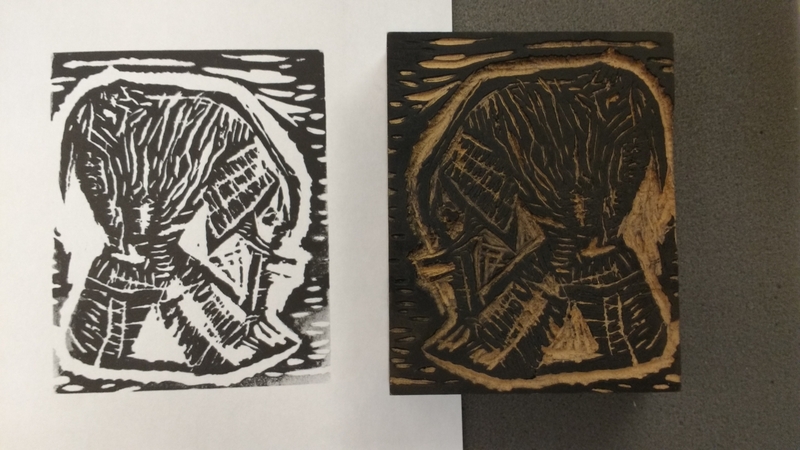 Let’s take a look at the faux wood-engraving I made (with apologies for the lack of artistry or wood-engraving skills) and a trial printing of it. As you can see, parts of the block were cut away (using the burin), leaving the outline of the elephant illustration on the original level of the block’s surface. (A version of the illustration had been made on the block as a guide for us to follow — as is always the case in wood engraving — but the goal was for us to leave the lines more or less intact and carve away the rest; the idea being that the printed surface would then replicate the guide illustration. Vestiges of these lines have been obscured by the printer’s ink now, though.) When the block is inked, these chiseled-away away sections — recessed below the printing surface — remain uninked and so appear as white space in the actual print — and also on the block itself, as you can see. Wood-engravings tend to accentuate black colors, as you can see in this crude example. In the hands of a real master wood-engraver, like Thomas Bewick or the Dalziels, the effect can be highly dramatic! Do you notice anything fundamentally different about the block and the print-out made from it? The print image is reversed. This doesn’t really matter in an illustration like this, except perhaps for a more aesthetic effect one way or the other, but imagine if the block depicted an actual landscape scene, a building, or included some lettering! 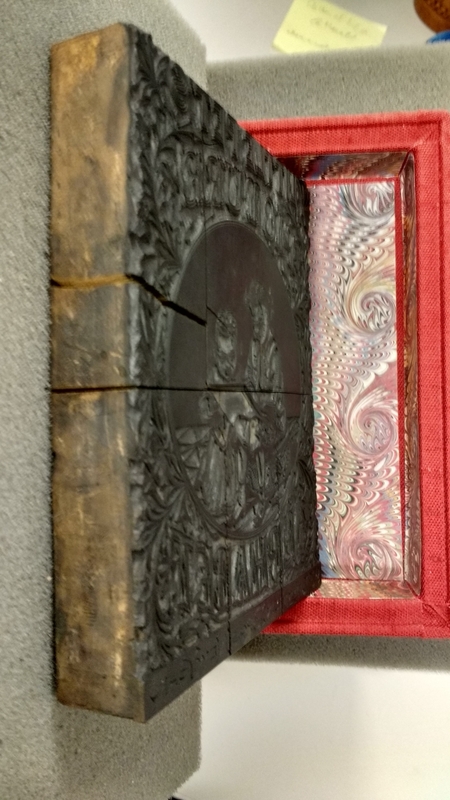 The wood-engraver would have to work “in reverse” in order for the actual print to have an accurate orientation. Even if a mirror, or reverse-view guide-image was used, imagine how much harder this would make the cutting! Hands-on work like this project really brought home the skill of the wood-cutters to all of us in the class — and also the sheer level of physical effort needed to engrave the block — and not obliterate the image by chiseling out too large a gouge (my elephant almost lost an eye that way, as you can perhaps see if you look closely). 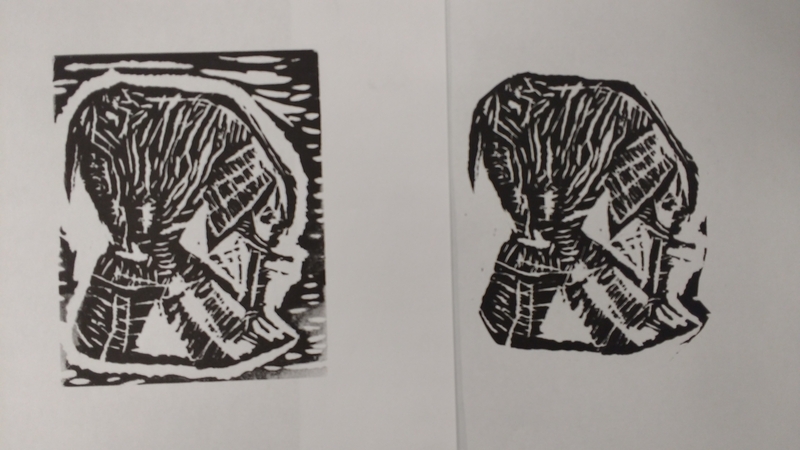 Two printings from of the same block: one the whole block (on left) and the other with the background masked out by a paper frisket (on right). Take a look at the two prints above and see if you can spot the difference and figure out how that was done… The print on the left displays the entire block’s illustration — the elephant and the quasi-decorative border. For the print on the right, I used a paper “frisket” to effectively mask off the background (it’s not perfectly done, as you can see on the right edge, but I hope you get the basic idea). The frisket here was just a piece of paper cut to mask off the area outside the illustration outline, or any area you don’t want to print — Photoshop-style techniques done manually! In a case like this, we might want to hide the border to make the illustration fit more harmoniously on a page with letter-press text above and below — or for the sort of small vignettes often seen on title pages or as head- or tail-pieces in wood-engraved books in the hand-press era. A frisket could also be used to facilitate the printing of two-color illustrations (usually red and black), by first masking off the area to be printed in red, and then masking off the area already printed in black with another frisket when red was printed. This allowed the page to be printed without unlocking the printing form or the whole illustration by just re-inking the added red color– a significant saving in time, effort, and money at the time. The same basic approach was also used for red and black text on the same page, in many cases. As so often happens, once you learn about something in one context, you seem to happen upon another related instance soon afterward. Just days after returning to work at Cotsen Library after Rare Book School, we were looking at a wood-engraved block from the mid-nineteenth-century, used by McLouglin Brothers — the renowned New York publisher of children’s books, games, paper dolls, and paper-based toys of all sorts from the mid-nineteenth century- into the early twentieth century — to print the upper paper wrapper of their children’s publication, Little Pet’s Picture Alphabet, especially unusual since the block is housed with a copy of the actual toy-book-like publication now (Cotsen 32858). You can see the “mirror image” relation between the block itself and the printed version again. I think that the essentially outline line-illustration and black half-circle backdrop around the children was printed upon red paper (or paper printed red), but I’m not certain. The black area has the kind of “textured” irregularity usually found in solid black areas of wood-engravings or wood blocks; pure black was hard to to print smoothly via a woodblock, made from organic, naturally textured wood (in contrast to the smooth surface of an unworked metal plate used for intaglio printing). Side view of the composite wood-engraved block, highlighting the lines between the separate individual blocks. You can also see the lines between different pieces of the composite wood-engraved block — it looks like seven separate blocks to me. 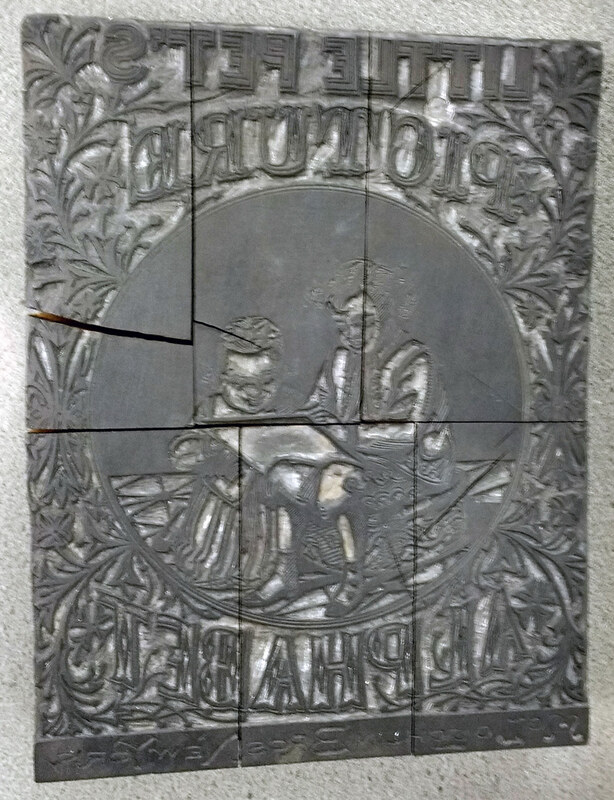 This enabled several engravers to render an illustrator’s artwork on different blocks at the same time — time was money in printing then, as now. It’s also possible that separate interlocking blocks were somehow easier for McLoughlin to store and manage, and perhaps also to re-purpose individual blocks for other illustrations, as the firm often did. (For large illustrations, of course several — sometimes, many — wood-engraved blocks would have to be used; how many trees do you see with smooth straight 11″ x 17″ — or larger — sections from which a smoothed block that size could have been made? Large planks were in high demand in the hand-press era for things like ship-building for the navy and trade vessels too.) And for wood-engraving blocks, which run across the grain, we’re looking for trees with that size as a usable circumference, not counting the bark, outer ring, and core. Metal engraved plate: Note the residue of black ink in the grooves and incised lines made by a graver; these printed out as black lines in trial prints, with the unworked “surface” part of the plate not printing. However our sub-journeyman engraver here (i.e. me) forgot a basic fact of printing when adding the text, didn’t he? Take a look below! The image prints in reverse of the plate! So his “JB” monogram initials and and his brief quote, from the Tempest, are also printed in reverse. Oops! What to do? Scratch out the text and try to doctor the plate somehow? Weep in frustration? Engraved metal plate (right), with inked outlines visible in the grooves, and a proof printing (left), which reverses the plate’s orientation of both illustration and text — making the latter illegible. Back to the drawing board! Mercifully, the course instructor and Grand Maester of Printing Processes, Terry Belanger, immediately had a solution — a “counterproof” print. We removed the plate and used-the newly-inked print (whose ink was still damp) to print another version of the illustration — in reverse of the print– on a new sheet of paper, which resulted in a correctly douple-reversed orientation of the engraved text. “Original” print (right) and counterproofed, second version , reversing the illustration and text a second time — now the text is legible! As you can see in the “print-counterproof” print comparison above, the counterproof reversed the engraved test’s orientation a second time, so now it’s legible. This served the bill perfectly here, although it would probably not have been a viable tactic in a commercial printing establishment, even one with a limited printing run of 500-1000 copies. (And the sub-apprentice engraver avoided having his ears boxed by his master for executing poorly thought-out work!) 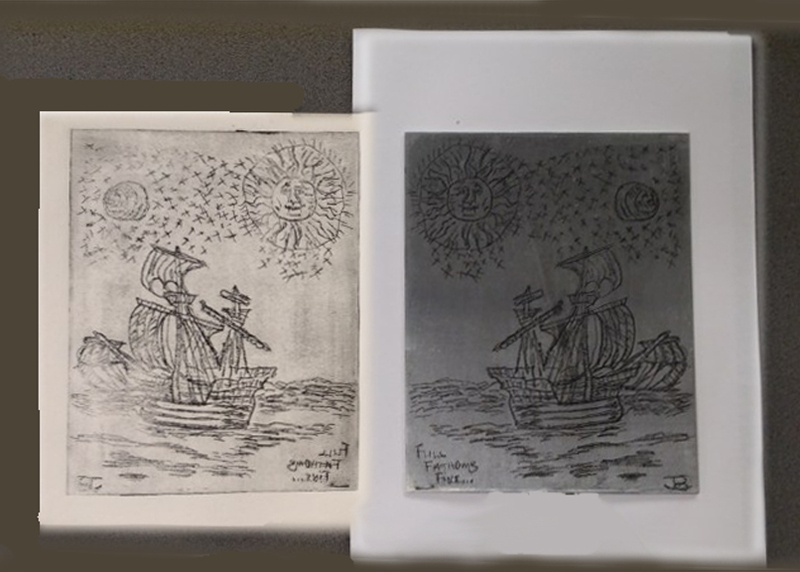 Not surprisingly, the counterproof printing is lighter than the first version, since it relied on wet ink from the print proof, and some of the toning from ink on the surface of the plate (visible below the sun in the first proof) is similarly missing. But disaster was averted! And the lesson also indubitably imprinted in my mind too. 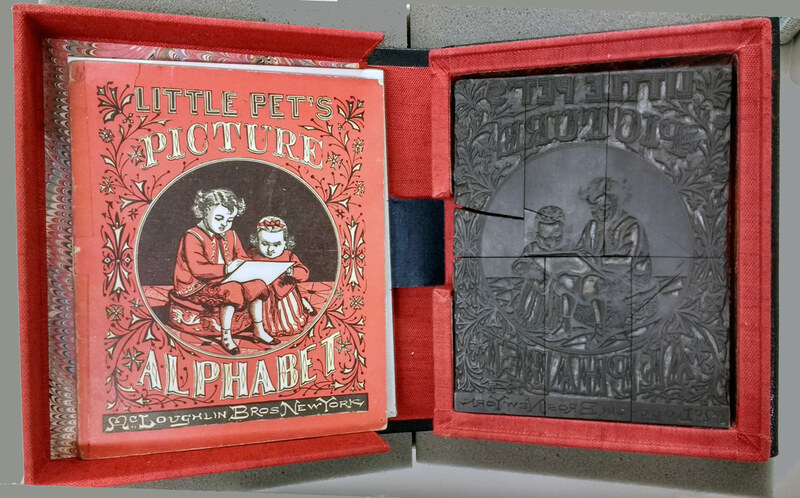 The “reverse” aspect of letterpress type and relief and intaglio printing (like almost all illustration processes) is one of the aspects we always stress for students or others to whom we present rare printed books. Imagine setting all the type, using thousands of individual pieces of individual metal type letters, set in reverse, and also set from the end of the lines to the beginning, in the First Folio or Gutenberg Bible! And don’t forget about spacing or justifying type in the center of a page or column; this required flat (non-printing) metal spacers, a good eye, and sometimes adjustment of the spacers after an initial proof print was made. (Of course, large books requiring as much type and paper as the First Folio, were generally not all set in type at the same time — few, if any, printers had that much type on hand to use, even with borrowed type or in syndicated print jobs, nor could they afford to tie it all up in a single time-consuming book project like the First Folio; printers needed some type readily available for job printing, handbills, and broadsides in order to keep paying their bills! “Drypoint” is another intaglio process we looked at closely in “Book Illustration Processes” and one at which we also tried our hands. In drypoint, a steel needle replaces the rougher engraver’s tool and allows an illustrator to draw directly on a metal plate, with something vaguely like the experience of drawing on paper. Unlike graver or burin, which scoop the shaved metal bits out of the incised lines, the thin needle throws up a “burr” on both sides; sometimes this burr is removed and sometimes left intact “adding richness of line to the design when printed” (John Harthan: History of the Illustrated Book, p. 282). For class purposes, we used thin, clear acrylic sheets for our drypoints — softer and easier to work than metal, easier to proof in a preliminary way, using very lightly inked paper run across the engraved surface to reveal details (or lack thereof! ), and most important of all, the clear sheets allowed us to place a printed master image to copy right underneath the acrylic sheet and essentially use the needle to “trace” lines on the sheet — or attempt to. A real illustrator wouldn’t need such a guide to follow and would probably also prefer the flexibility of drawing freely, which is one of process’s main points of attraction to artists. No need for a “mediating” engraver with a drypoint. 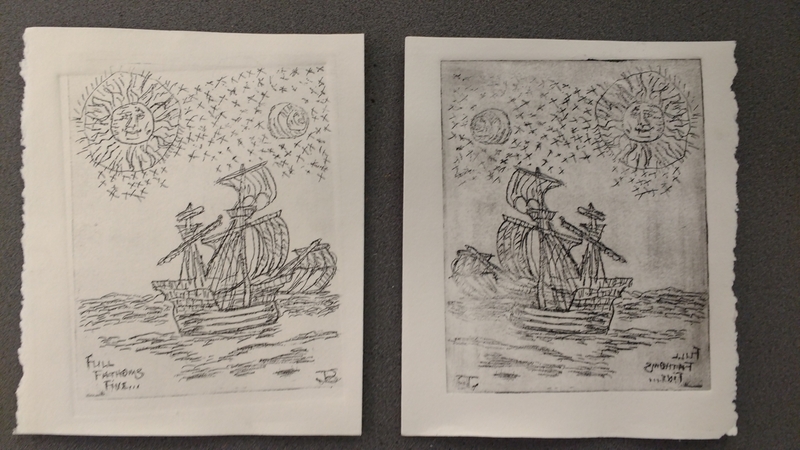 Drypoint intalglio as executed on clear acrylic sheet (right), with proof print (left). Note the visible outline of the plate-mark on the print. 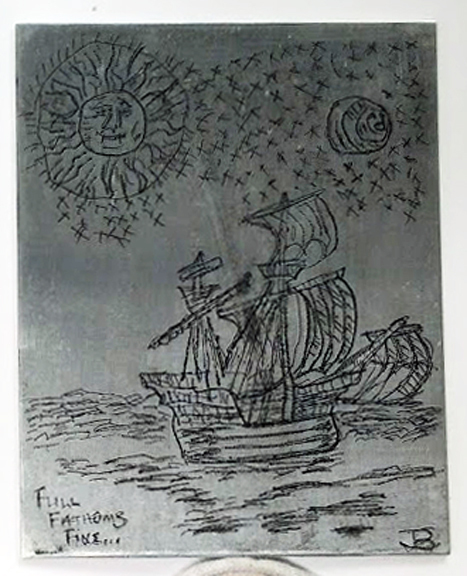 Plate-marks are one of the tell-tale signs of intaglio illustration processes — if you’re lucky! Sometimes, they can be faint or virtually invisible. I hope I’ve shared some of what I learned about illustration processes with you, and in a way that clarifies what can be murky abstract concepts with differences that can also be hard to explain without showing actual examples — good, bad, or indifferent in artistic terms. Wood-engraving, intaglio metal cuts using both copper and steel plates, and drypoints were all important illustration processes in children’s books from the early- to mid-eighteenth century through the early twentieth century. There were other processes too, such as mezzotints and aquatints, but all of these were non-colored processes, except where hand-coloring or stencil-coloring was used.